Horror From the Tomb was published with a September 1954 cover date by Premier Magazines. It clearly used it's most outrageous and anti-Wertham stories in this issue. Starting with issue 2, it would be retitled Mysterious Stories and would feature less blood and gore and with issue 3, it would code-approved and lean more toward odd stories and comedic horror parodies. Click to enlarge the pages. Is it just me or does this ending feel like a cop-out? A werelion? Really? Also, none of these people are dressed like they are going mountain climbing. I love how the werewolf is shaking his fist in the last panel. "Curse you, irony! Curse you! I...die..."
It's amazing how easy it is to break out of a grave in stories. Does becoming undead make you stronger? You are in a pretty well made wooden box six feet underground. I don't even understand how it works nowadays considering dead people are now put in a concrete vault in many places. If you notice, what we are led to believe is a good guy, is really a bad guy. The corpse hates Roger because he's too honest and he died of HAPPINESS!?! Roger Barton was clearly too pure for this world. 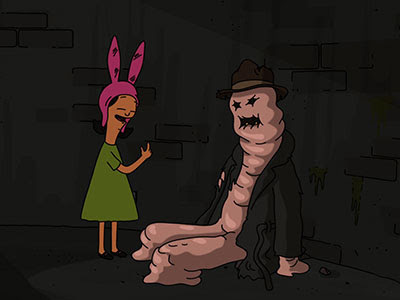 Let's be honest, haven't we all dated a gelatinous blob held together by fake body parts at some point in our lives? Wait. Did the professor strangle the dog or break its neck? Either way, he killed it. "You better look away"? I don't know of any woman these days who would be okay with a guy killing a dog while on a date no matter how dangerous it seemed. And this is why you don't make people who work in a museum upset. They will kill you and somehow display you in the museum. One this I love about this story is that there is an ad right after it for a rosary with beads filled with water from the fountain in Lourdes. You finish reading a story where a guy kills half a dozen people and melts the skin off their bones and then you can get yourself a rosary for five bucks. Perfect! Speaking of how easy it is to dig your way out of a coffin six feet underground, heads just pop off willy-nilly don't they? Just apply a little pressure and *POP* head comes off. For some reason, this reminds of the episode of Bob's Burgers where the kids explore the abandoned taffy factory and find men made of taffy that were made to protect the taffy owner's money from the government. 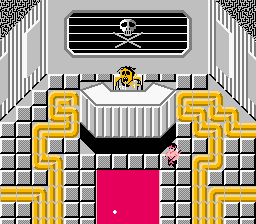 The skeletal remains also remind me of one of the bosses in the Nintendo game "Ikari Warriors."